In our previous discussion, we examined the four main functions of our tires, the methods and materials used in their construction, and factors unique to motorcycle operation affecting tire design. Let’s now move on to factors affecting selection and purchase, as well as maintenance. While we’re specifically speaking about GL1800 tires here, the information generally applies as well to tires for all other motorcycles. At the time of its introduction, the GL1800 was the largest, heaviest and most powerful motorcycle ever to be equipped with radial tires. Thinking back to our discussion of sidewall stiffness and tread compounding specific to a particular bike’s weight and intended use, we can understand why, though radial tires existed at the time that fit the new GL’s rims, new tires specific to the GL1800 had to be developed. That is why it’s important when purchasing new tires that the selections be listed by the manufacturer as designed specifically for fitment to the GL1800. The correct sizes are 130/70R 18M/C 63H inflated to 36 pounds per square inch cold for the front and 180/60R 16M/C 74H inflated to 41 psi for the rear. What do all those letters and numbers mean? Read on. The first three digits indicate the tire’s tread width in millimeters. The next two digits indicate the aspect ratio, which is defined as the section height divided by the section width, and the result multiplied by 100. The 1800’s rear tire has an aspect ratio of 60, meaning the total tire height from bead surface to top of tread is 60 percent of the tire’s width as measured at the widest point of the sidewalls. These measurements are in the inflated state. Is aspect ratio important? Couldn’t we safely install a 70-series tire in this application? 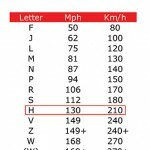 While it may be used to define a bike’s ride height and geometry, and sometimes used by the bike’s owner to correct speedometer error, stiffness of the sidewall is also affected. I’ll leave it to the reader to review the effects of sidewall stiffness on camber thrust and other factors as presented in the previous discussion. Moving on, the R indicates radial construction. The next four digits (e.g. 16M/C) indicate the correct rim diameter for fitment and the fact that the tire is motorcycle-specific. 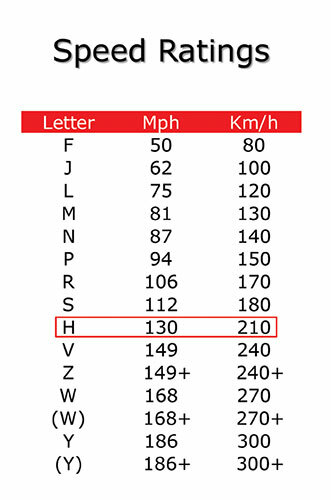 Of the last three digits, the two numbers indicate the tire’s load index, and the letter indicates the speed index. This is an explanation of the Metric Designation scheme applied to GL1800 tires. Two other schemes in common use are the Inch Designation and Alpha-numeric Designation. These most often apply to tires designed for different styles of motorcycles (cruisers) and older motorcycles (GL1000, 1100, etc. ), but they contain the same basic elements. 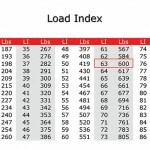 Charts showing the relationship of load index to load rating and speed index to maximum speed rating are included at the end of this article. All tires manufactured after 1999 have a four digit manufacture date code stamped on the sidewall. It may appear inside an oval-shaped depression and be preceded by letters which have no meaning to the buyer. Of the four numbers, the first two indicate the week of manufacture (1 to 52), and the last two indicate the year. Previous to the year 2000, the date code was three numbers. It identified the week of manufacture, but the decade could still be in question. Example – 322. Is that the 32nd week of 1992, 1982 or even 1972? The various manufacturers tell us not to install or ride on tires more than six years after their manufacturing date. Those tires will have hardened to the point that they may not seat or adjust properly on the rim, and they could lose traction in situations that wouldn’t affect a fresh tire. 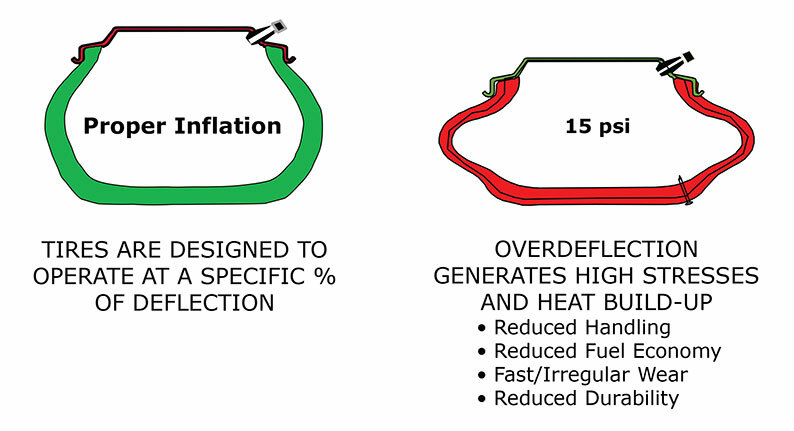 The recommended cold inflation pressures are listed in your owner’s handbook and should always be used, unless the tire manufacturer lists slightly different pressures for that particular tire model when used on your particular bike model. Often, they don’t. Pressures should be checked and/or adjusted when the tires are at room temperature, or at least one hour after the bike was last ridden. This is to insure that the tire will not be under inflated when actually riding. Temperatures can go up considerably in use, which will naturally increase pressure. But these factors are taken into account by the manufacturer. Never check a hot tire and reduce its pressure to cold specs. What else could elevate tire temperature, possibly to the point of catastrophic tire failure? 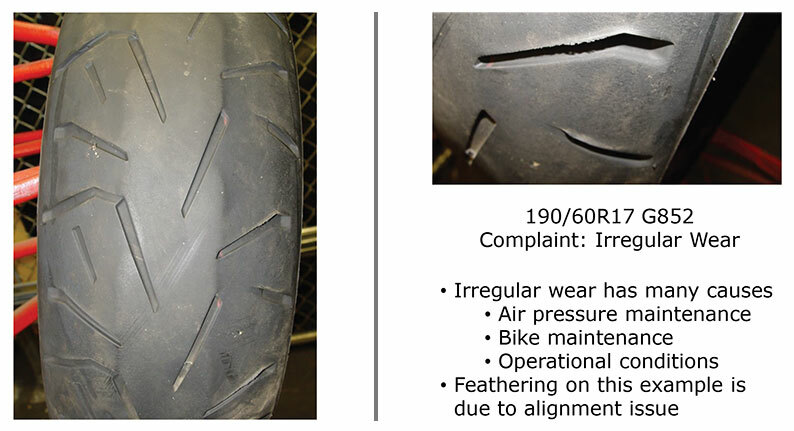 Underinflation is very dangerous, and tire checks performed at rallies by manufacturers indicate that perhaps 50 percent of all street bikes are being ridden on severely underinflated tires. If ridden long enough and at a high enough speed, an underinflated tire is prone to overheat severely and disintegrate from the inside out. This can be seen as tread separations, bulges in sidewalls, grossly irregular tread wear and other symptoms, which are almost always attributed to “junk tires.” In fact, the issue is a junk-pressure maintenance regimen on the part of the rider. If the rear tire pressure is specified as 41 psi cold, is 35 psi really that bad? You bet your life. Literally! That 6-pound reduction in pressure reduces the tire’s safe load by around 100 pounds, and many of us, when touring two-up and possibly with a trailer, are already exceeding the bike’s stated maximum load weight. Remember, the maximum load listed on the tire’s sidewall applies only at the cold inflation pressure indicated. We’ve all been there … out in the middle of nowhere, and the rear tire picks up a nail. So, we carry a tire repair kit and either a pump or CO2 bottles to fix that problem. But is it really a permanent fix that can be relied on? We’d like to think so, especially as it so often happens to a relatively new tire. Whether using the old standby red rope-style plugs or the rubber, mushroom-style plugs, the initial effectiveness is up to the skill and knowledge of the person performing the repair. Why did we say “initial effectiveness”? Some punctures, whether due to the size and shape of the damage or its location on the tread, cannot be safely repaired and expected to hold under stress. Further, the bike’s tire is being rolled left to right during maneuvering, which causes the repair to experience changes in pressure and direction of that pressure. All of this tends to work the plug in the carcass and weaken the repair. Though the rubber mushroom-style plugs at least form an internal cap over the repair if properly installed, proper installation can only be assumed, not guaranteed. A repaired tire should be considered to have a reduction of one level in load index and speed index and be replaced at the earliest opportunity. Nitrogen tire filling is still a relatively new service in the automotive industry, and myths and misinformation abound. So let’s discuss some of those myths and some actual truths about nitrogen tire filling. Then perhaps we can draw our own conclusions. While most tire manufacturers endorse the use of nitrogen as an alternative to air, they do so based only on a tire’s ability to retain pressure for a longer period of time. This is based on their knowledge that most motorists don’t examine tire pressures till the tires’ sidewalls bulge noticeably. Even with the use of nitrogen as an inflation gas, regular inflation pressure checks are highly recommended. While nitrogen leaks past rubber at a slower rate than oxygen, there are other issues involved – issues such as valve stem leaks, rim seal leaks, and punctures that can cause dangerous riding situations if not discovered during routine pressure checks. Topping off with compressed air when nitrogen isn’t available is likely to reduce the tire’s contents below the minimum 95-percent nitrogen purity rate needed to obtain the benefits and also may introduce moisture – completely negating the nitrogen’s benefits. Does nitrogen, in and of itself, provide longer tire life and increased fuel economy? NO. Proper inflation is what provides those benefits. The nitrogen is simply a way of reducing pressure loss and keeping tires correctly inflated longer than if compressed air were used. Claims regarding a tire’s smoother ride and greater safety factor in case of puncture if inflated with nitrogen are dubious, at best. Again, it’s correct inflation pressure that is responsible. Do tires filled with nitrogen last longer (chemically) than those filled with air? Atmospheric air is already 78.1-percent nitrogen, so what benefit comes from increasing that level? Oxygen permeating the tire carcass ages the tire, so increasing the nitrogen content takes a back seat in importance to decreasing the oxygen content, along with the moisture and other contaminants contained in the tire’s air. Even so, the tire is still exposed on its outside to the aging effects of oxygen and ozone, so don’t assume that the six-year rule for tire replacement is increased by the practice of nitrogen filling. What about claims of reduced pressure fluctuation due to temperature change and reduced corrosion from lack of moisture if using nitrogen? Once again, it’s not the nitrogen that directly creates these benefits. In perfectly dry conditions, nitrogen and air have very similar expansion characteristics – 1.9-percent pressure change for every 10 degrees Fahrenheit change in temperature. But compressed air supplied from the typical shop compressor usually contains water, and as the tire temperature increases, this water vaporizes to a gas. The increase in gas increases the tire pressure, sometimes dramatically, depending on the amount of water present. Of course, the increase in temperature of all gases in the tire result in pressure change, but the introduction of moisture makes the situation far worse. Nitrogen intended for use in filling tires is supposed to be chemically pure, but poor filtration of the supply or contaminated equipment could well replace the contaminated mixture of gases in your tire with 97-percent pure nitrogen contaminated with moisture and oil vapor. This will result in temperature related pressure fluctuations similar to compressed air, regardless of the absence of oxygen and other gases. Corrosion issues due to interior moisture will exist with either high moisture-content air or contaminated nitrogen. The bottom line here is that nitrogen will only reduce corrosion and temperature related pressure fluctuations if it contains less contaminants than the air it replaced. Shops frequently purchase equipment based mainly on price and often do not invest in proper filtration and regular maintenance programs, so my hunch is that many consumers leave a nitrogen filling appointment with far less in the way of benefits than they imagine. We’ve discussed tire date codes and the six-year maximum recommended use interval. Now let’s talk about tire wear. 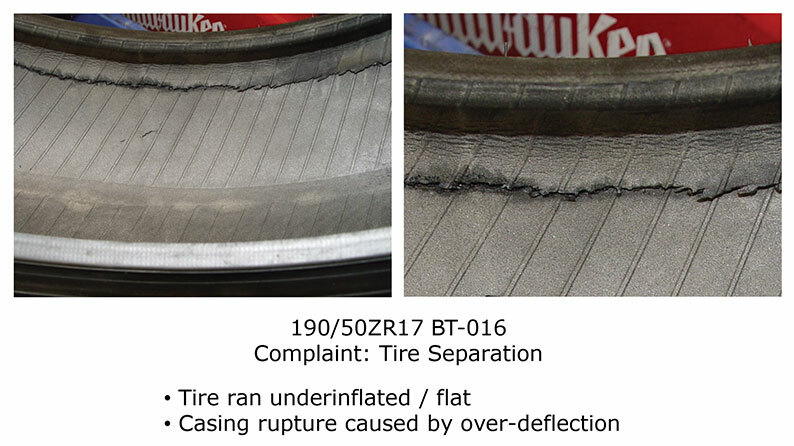 Underinflation, overloading and severe braking can all cause irregular tire wear. If it affects handling or ride noticeably, the tires should be replaced. Otherwise, replace your tires at or before the time when the wear bars become flush with the tread surface, noting that wear will accelerate after that point, and the tread sipes won’t be deep enough to be effective in channeling away water. What are wear bars? Looking at the point on your tires where the sidewall meets the tread, you’ll notice small arrows marked TWI (tread wear indicator). Looking straight across the surface of the tread at those points, you’ll find raised portions down in the sipes. These are the wear bars. There’s one last point I’d like to make regarding timing a purchase. Please … don’t leave home on a 2,000-mile rally trip with 1,500-mile tires, believing you’ll find a great deal on replacements at the rally. That usually doesn’t happen anymore, and you risk your safety riding on worn-out tires. Not only that, but the folks who install tires at these events aren’t necessarily familiar with your Gold Wing’s maintenance procedures and specifications. At rally’s end, they evaporate into thin air, leaving customers unlucky enough to have installation issues twisting in the wind. GWRRA recommends that if you bring your bike to a rally, remember to research the company providing service on your bike. GWRRA emphasizes that it makes sure to have reputable vendors at all its events and that they are there to provide the best service they can to you. Or, install your new tires before leaving home, and early enough to give yourself time to thoroughly test the bike before departing. 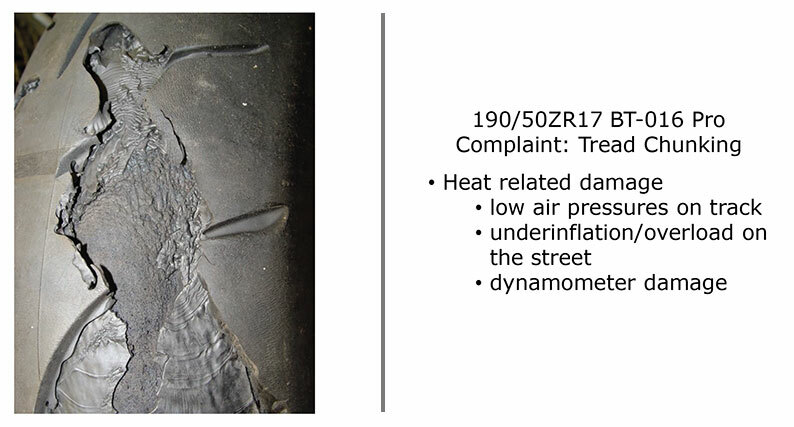 The speeds associated with these codes are the maximum sustained speeds for tires inflated to the maximum cold inflation shown on the tire’s sidewall. 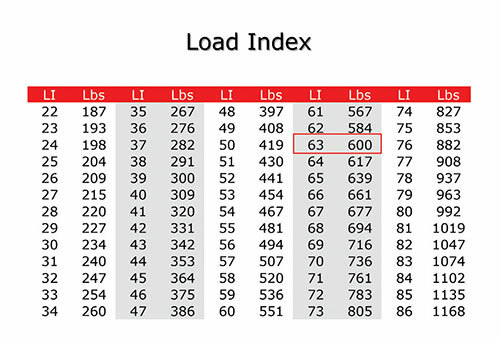 The following load index table shows the maximum load the tire can sustain at the maximum cold inflation pressure shown on the sidewall. Load capacity diminishes as pressures are reduced. There are many more indices, but they apply mostly to tires for larger, heavier vehicles. Posted 05/19/2015 by wing & filed under Featured, Gear, Tech.